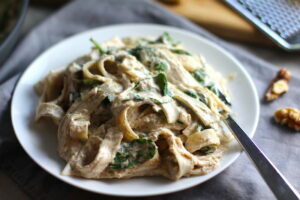 This Walnut Sauce recipe with Ricotta and Spinach is thick, rich, nutty, and creamy. 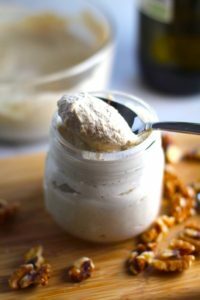 It’s inspired by the traditional Italian Walnut Sauce from the North-western Italy, Liguria Region, but my Walnut Sauce recipe adds even more decadence with creamy ricotta and more nutty parmesan cheese. 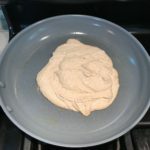 I had Walnut Sauce for the first time last month in Italy when my husband and I were vacationing in Cinque Terre. It was served with Pansotti, which is a stuffed pasta similar to ravioli, filled with ricotta and spinach. 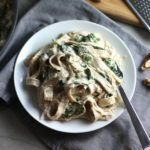 My recipe deconstructs the dish a bit and simplifies the recipe putting those wonderful ricotta and spinach ingredients directly into the sauce and mixing it with a simple Fettuccine. 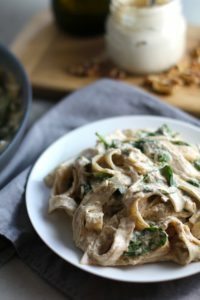 For this Walnut Sauce recipe, you can make the sauce entirely ahead of time and then mix it with pasta when you are ready to eat. 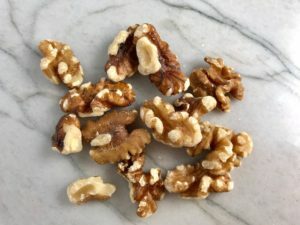 Walnuts are not just for sweet desserts! 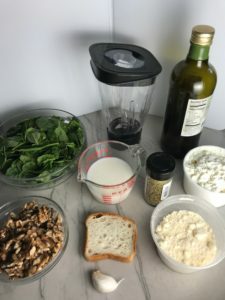 When you blend nuts, it releases the oils and in combination with a little milk and other savory ingredients, they blend together to form a deliciously creamy texture and taste. 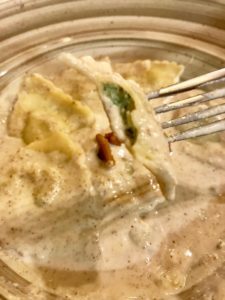 While cashew cream sauces have been a trend lately, I was so pleasantly surprised to find this Walnut version in Italy and to try out something different. 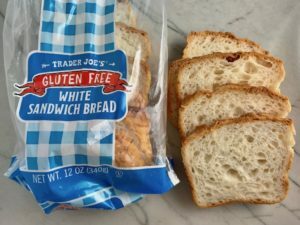 The traditional recipe uses bread to thicken the sauce, so I tried Gluten Free white bread from Trader Joe’s and it worked beautifully! Of course, you can use regular white bread instead. 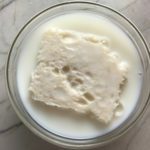 Cut off the crust of one slice and simply soak the bread in the milk for a few minutes. 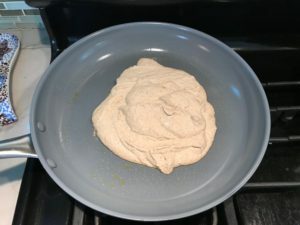 Once the bread is soaked, add it and the remaining milk to the blender. 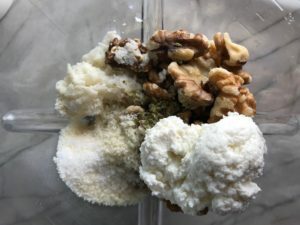 Also add to the blender the walnuts, parmesan cheese, ricotta, oregano, salt, garlic, and olive oil. Then Blend it up! 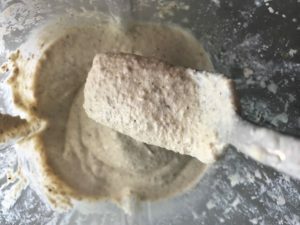 It will be extremely thick, so you may need to scrape down the sides and loosen the mixture up at the bottom of the blender a couple times. If it is still too thick to blend, add a tablespoon at a time of lukewarm water until it starts to blend smooth. You can store the sauce in the fridge for up to a week. 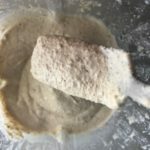 When you are ready to eat this amazing Walnut Sauce, pick your pasta and cook it according to pack instructions. 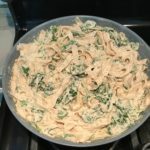 I used a Gluten Free Fettuccine that I love that’s made with brown rice flour, but you can use any pasta that you love in this recipe! 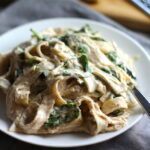 I have also used Wide Rice Noodles as fettuccine replacements before (see my Chicken, Tomato, Pepper, Pasta) and they work great! Warm your sauce through in a skillet and then add the baby spinach. Mix it so that the spinach begins to wilt, just a couple minutes. Then add the drained pasta, but MAKE SURE TO SAVE SOME OF THE PASTA WATER. As you mix the pasta into the walnut sauce you will find it extremely thick, which is how it should be. 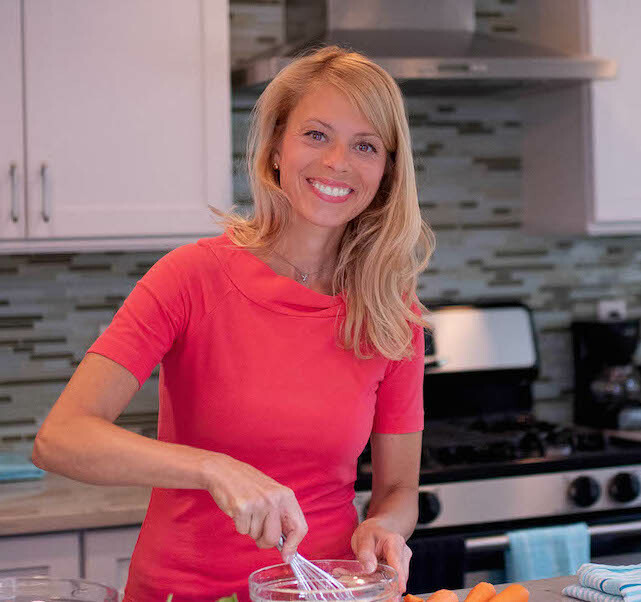 However, you will probably want to thin it out a bit by adding a tablespoon of pasta water at a time until it reaches the consistency you want. Finally season with salt and pepper to taste, plate and garnish with fresh grated parmesan. 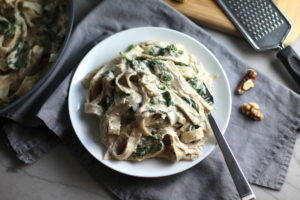 This Walnut Sauce recipe with Ricotta and Spinach is thick, rich, nutty, and creamy. 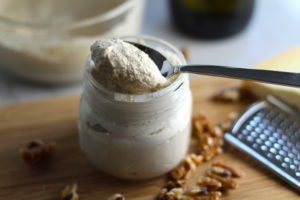 It's inspired by the traditional Italian Walnut Sauce from the North-Western Italy, Liguria Region, but my Walnut Sauce recipe adds even more decadence with creamy ricotta and more nutty parmesan cheese. 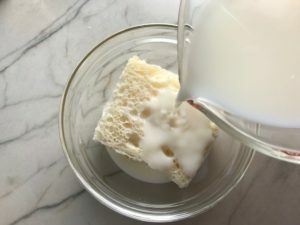 Cut the crust off the bread slice and soak in the milk. 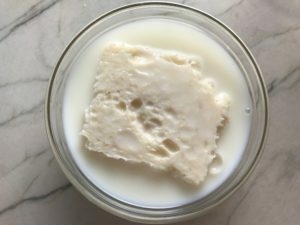 Once it is soaked, add both the soaked break and the milk into the blender. 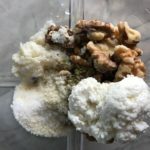 To the blender, add the walnuts, parmesan cheese, ricotta, oregano, salt, garlic, and olive oil. Pulse to start the blending and incorporate all ingredients. Then blend until smooth. If it gets stopped up, stir with a spoon or spatula. If it really can't get going, add a tablespoon at a time of lukewarm water until it starts to blend smooth. The sauce should be very thick at this stage. 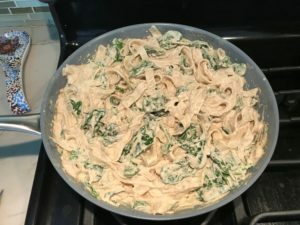 At this point, you can cook move on to warm the sauce and mix with the pasta and spinach or store in the fridge for up to a week. Cook the Pasta according to package instructions. Drain the Pasta, but save the pasta water for thinning out the walnut sauce. Coat the bottom of a large preheated skillet with Olive Oil. Then add the Walnut Sauce to heat through. Turn the heat down to low. Add the Baby Spinach to the sauce and mix to combine. You don't need to cook it long, just 1-2 minutes, as you want the bright green color and fresh flavor to remain. The heat of the sauce will wilt down the spinach. Once the sauce is heated through and the spinach starts to wilt, drain the pasta and add it to the sauce. Add 2 tbls of the pasta water to thin out the sauce slightly and mix through with this pasta. Add another tbls of pasta water if needed. Finally, taste for seasoning and add salt and pepper as needed. Serve the pasta with walnut sauce with freshly grated parmesan cheese and Enjoy! Wow, Carrie! This looks divine. What a perfect means to a simple but delicious weeknight meal. Or heck, an afternoon snack would be awesome as well. I love your ingredients. I gotta try it soon. Thanks, Kristy! You could definitely have this as a snack – perhaps a dip for veggies or crackers!